Where Heat, Hearth & Home Come Together! Call us Now! : 508-997-5524 Where Heat, Hearth & Home Come Together! Because Home is Where the Warmth Is! 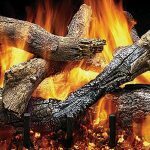 With two burner types, discrete controls, and an unparalleled realistic appearance, the Outdoor Fireside Grand Oak log set creates the appearance of a wood burning fireplace without the additional hassle.